Penrith have upset Minor Premiers Wyong to claim the ISP NSW Grand Final at Leichhardt Oval tonight. 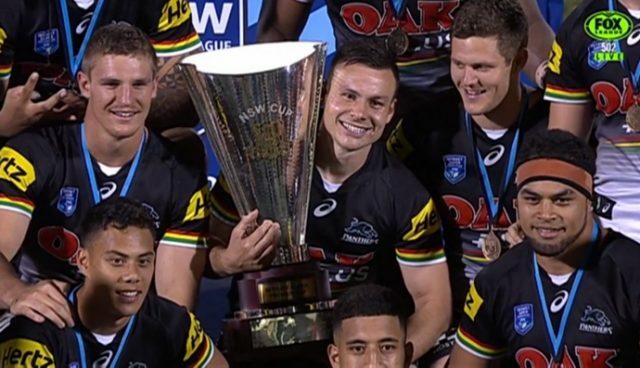 The Panthers produced a dominant second half to set up a date with the PNG Hunters at ANZ Stadium next Sunday for State Championship honours. Penrith won 20-12, withstanding a late Roos charge. The Garth Brennan coached Panthers were down 6-0 heading into half-time but a game changing try from Maika Sivo on the stroke of the break gave Penrith plenty of confidence heading into the second stanza. Tries to Tony Satini and Corey Waddell in the early stages of the second half gave the Panthers an impressive lead and opened the door for an historic premiership. Penrith players were elated after the game, starting wild celebrations after winning the reserve grade title. “It feels amazing – you work all year for that,” centre Jed Cartwright told Fox League. Penrith captain Darren Nicholls was named the official Man of the Match. “Everyone has done a great job and I’m very proud of everyone who has played for our ISP team this year,” Nicholls said. The only sour note for the Panthers was an ankle injury to forward Oliver Clark, who is in doubt for next week’s State Championship.